The Night Edition G-Class has been rolled out exclusively for the Japanese market. There is no shortage of special edition models for the Japanese market, and Mercedes is one of the principal purveyors of exclusive cars for the Land of the Rising Sun. The German automaker’s latest offering comes in the form of a Mercedes G550, dubbed the Night Edition. The special edition off-roader, wearing an Obsidian Black paint job, features special AMG fenders painted in titanium grey, 18-inch five twin-spoke alloys and a host of interior options. These include leather door panels and seats in a choice of classic red or porcelain white designo, a piano lacquer-wood trim, a dashboard wrapped in Kana jet black leather, an Alcantara roof liner and new floor mats. 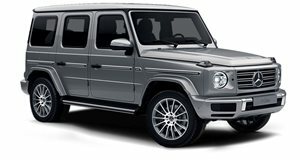 Mercedes plans to build just 100 units of the special edition G-Class, which will be showcased on 22 April at Mercedes-Benz Connection in Roppongi, Tokyo, before going on sale for 13,900,000 Yen (approx. $141,000).